If you are thinking that your bank is your best option for credit card processing, you are mistaken. In fact, banks are the worst choice for your credit card processing. We will explain the difference between an “issuing bank” and an “acquiring bank”. Without a middle man credit card processor, they can charge anything they want and merchants are none the wiser. As a side note, credit card processing is also known as “merchant services”. A credit card processor and a merchant services provider are the same thing and both names are commonly used. There are four entities involved in every credit card transaction. It begins with the merchant who is accepting the card as Party 1. The bank that funds money to the merchant is called the “acquiring bank” and becomes Party 2. The bank that issued the credit card to the customer such as Bank of America, Wells Fargo, Capital One etc. is called the “issuing bank” and is Party 3. Of course there is the customer using the card who becomes Party 4. The Merchant Services provider is Party 5 and oversees the entire process, serves as your advocate and negotiates on your behalf with the banks. The issuing bank is basically providing a loan to their customer, the cardholder. For each transaction, the acquiring bank technically makes a loan to the merchant. Both the issuing bank and the acquiring bank have fees that are deducted from the transaction. The merchant may receive the entire amount the next day and pay fees at the end of the month or fees may be deducted at the time of the transaction and the merchant may receive less money than the face value amount of the transaction when they are paid by the acquiring bank. The issuing bank’s fees are called an “interchange” fee. The acquiring bank’s fees are called the “discount rate”. The discount rate can also include some additional fees. These fees are expressed as a percentage of the original transaction amount. There may also be a flat fee per transaction that could be added in by either the credit card processor or the acquiring bank. There are also fees charged by the card brand such as MasterCard or Visa that are also tacked on and go to the respective brands. Issuing banks can issue a particular brand such as MasterCard or Visa. American Express and Discover act as both the issuing and acquiring bank. They charge a flat percentage of the transaction. As a courtesy, they work through a merchant’s acquiring bank so that a merchant only has to use one terminal or method to process all transactions. The card brands charge a fee to the acquiring bank so they can make money too. Asking a merchant services provider what their rate is will never get you the answer you seek. In fact, the answer you seek doesn’t exist. Every single transaction is different. 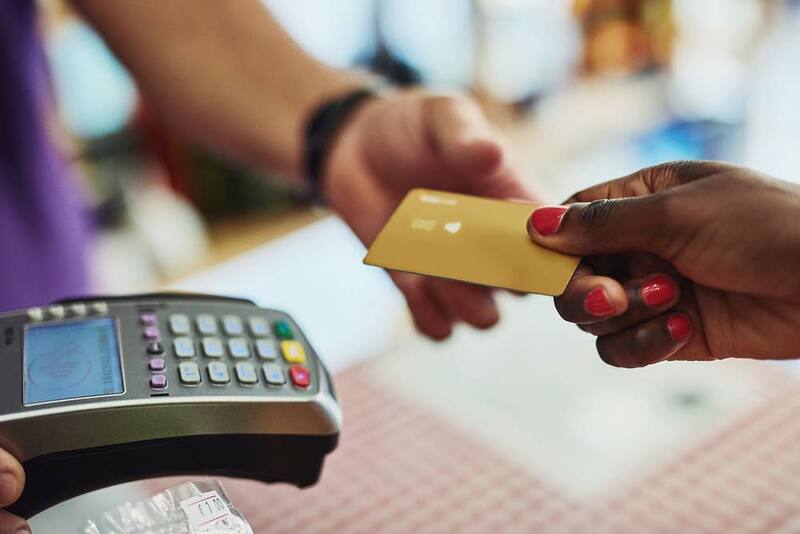 The fees vary based on whether the card is present during the transaction, what type of card is used, such as a “rewards card”, a card used by a government entity, corporate cards and other factors. Also, the type of business you operate can also affect the interchange rates based on how likely your business is to have a chargeback. Transactions that take place in your business with the customer in front of your, swiping their card or using a chip reader and signing for the charge are the safest transactions. If you compare your processing rates with another business owner in a different line of work, you may find they pay more or less than you. It is all decided by risk factors. The riskiest transactions are the ones that are done by phone or online. If transactions are typically large, the bank is at a higher risk. If the business is of the kind that tends to generate a lot of complaints such as online gambling sites, the risk is even higher. Processors use four-digit “SIC” codes (also known as MCC codes) that are issued for a wide variety of businesses as defined by the federal government. Interchange rates are based in part by the code of your business. A Merchant Services Provider such as Chosen Payments is in constant contact with their merchants. They act as an arm of the acquiring bank but are a separate entity and operate as an independent business. A Merchant Services Provider works with a specific acquiring bank. The processor executes the mechanics of the transaction: transmitting information among the merchant, the issuing bank and the acquiring bank. As you may know, an “underwriter” assesses risk. When you accept credit cards, you are actually “borrowing” money from the acquiring bank. When the acquiring bank transfers cash to the merchant, it is assuming the risk that there might be a chargeback. That risk remains present until the transaction completed. In the case of an order that must be shipped, the transaction is not complete until the merchandise is delivered in good condition. Technically, it is still incomplete until the warranty expires. Despite that risk, the acquiring bank puts the money in the merchant’s account soon after the transaction is initiated. The acquiring bank views this as a loan and that is why your financial ability and financial fitness is evaluated. Every merchant services application requires a Social Security number and your assets are reviewed to make sure the bank doesn’t take a bath. In this simple analogy, let’s say a merchant unknowingly accepts a stolen credit card for a $10,000 transaction. The next day, the money is in the merchant’s account. The merchant spends that $10,000 paying bills. Five days later, the true owner of the card learns his card has been stolen and used to buy $10,000 worth of product. The acquiring bank that fronted the money will attempt to debit it back from the merchant’s account. If the money is not in the account, the merchant must be financially sound enough to come up with $10,000 immediately. After all, it was the merchant who took the stolen credit card and the bank should not be out the money because the merchant failed to verify the ownership of the card during the transaction. But, since they gave the merchant the money, they are at risk and this is why there is an application process to accept credit cards as a merchant. And as with any personal guarantee, this one is likely to affect your credit score and your ability to borrow money outside the business. At the very least, if you shop around for merchant services, as I did, your personal credit report will show multiple inquiries — with whatever effects that might have.